Rogier van der Weyden never signed any of his paintings, but scholars know a man of this name was living and painting in Belgium during the 1400s and have worked in recent years to identify paintings that were most likely created by him. 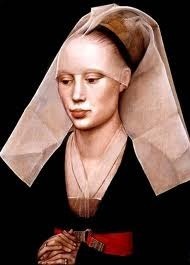 Van der Weyden's style is most often characterized as one that paid special attention to human emotion. Due to loose record keeping and the devastating effects of World War II bombings, uncovering information about Rogier van der Weyden has posed a real challenge for art historians and scholars. Nonetheless, they have managed to patch a coherent chronology of this painter's life and work. 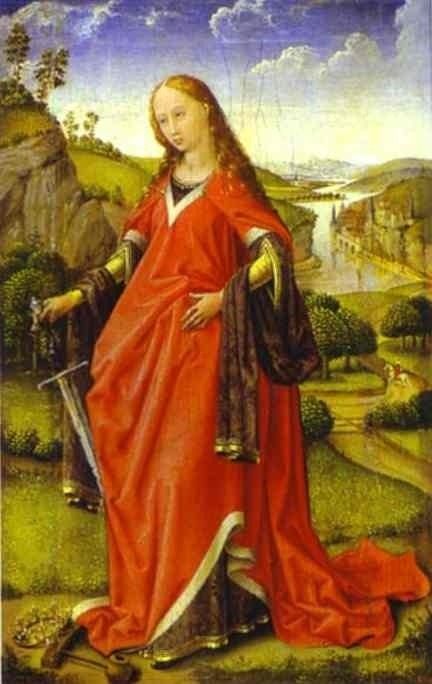 Rogier van der Weyden was born around 1399, the son of a knife manufacturer, Henri de le Pasture, and his wife, Agnes de Watrelos. He was born in Tournai, a city located in present-day Belgium near the French border, the only Belgian city to have ever been ruled by England (briefly, between 1513 and 1519, well after van der Weyden's death). In about 1427, van der Weyden married a Miss Elisabeth Goffaert (c. 1405-1477), the daughter of a well-to-do shoemaker from Brussels named Jan Goffaert. The couple went on to have four children - Cornelius, Margaretha, Pieter and Jan - and it is believed that they settled in Brussels after living in Tournai for a few years. Unlike many of his contemporaries, van der Weyden is believed to have entered the painting profession later in life, perhaps when he was in his early thirties. Records indicate that a certain Rogelet de le Pasture (a French translation of Rogier van der Weyden) was the apprentice of the mysterious Master of Flémalle, possibly identifiable as Robert Campin. 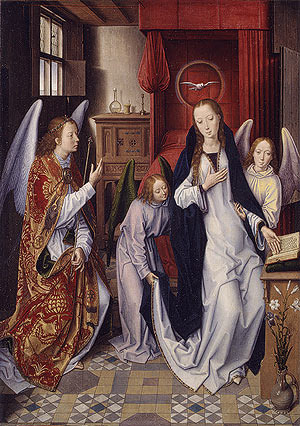 Art historians and researchers speculate that the paintings Virgin and Child, St. Catherine of Alexandria, and The Visitation should be attributed to van der Weyden as works he completed shortly before leaving Campin's workshop to open his own. It was also during his middle years that van der Weyden was named the town painter for Brussels, in May 1436. From here, his fame spread and he began to receive commissions from the likes of Leonello d'Este, Marquis of Ferrara and John II, King of Castile. Van der Weyden was not only a prominent painter in Brussels but also a savvy investor. 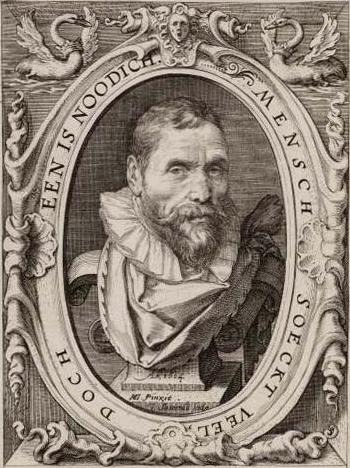 His wise investments in Brussels and Tournai provided for his family handsomely and allowed him to make a number of charitable monetary and artistic donations to the Carthusian monasteries (or charterhouses) in Scheut and Herinnes, where his son was a monk. 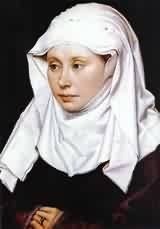 Van der Weyden remained prolific during his later years, acting as one of the administrators of the infirmary and charitable foundation Ter Kisten in Brussels and a member of the Confraternity of the Holy Cross. He died in Brussels in 1464 and was buried in St. Gudula Church, now referred to as St. Michael's Cathedral. Van der Weyden never signed any of his paintings, leaving subsequent art historians to piece together his body of work in the manner of super-sleuths. Works that have been attributed to him are difficult to date precisely, and scholars cannot agree on one chronology for his paintings. All attempts to categorize his works into early, middle and later periods should be understood as speculative. 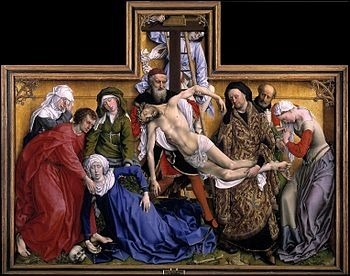 Van der Weyden is believed to have become a master in the Tournai painters' guild in 1432, when he was in his early 30s. To achieve this level, he must have been studying in Campin's workshop for a number of years although no surviving records clearly indicate this. Despite a definitive chronology, many scholars suggest that the works Virgin and Child, Virgin and Child and St. Catherine and Visitation are early works completed by van der Weyden, executed shortly after he left Campin's workshop. 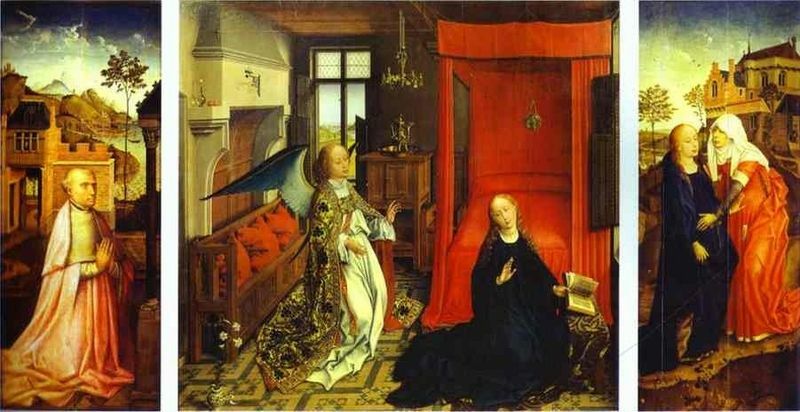 Other art historians point out, however, that these works lack the "geometric harmony" that van der Weyden's authenticated paintings - like Magdalene Reading - possess, arguing that these early works should instead be attributed to younger members of van der Weyden's new and loosely organized workshop. Magdalene Reading is a work that has almost certainly been painted by the same person as later works, like the Miraflores Triptych and Descent from the Cross, which are confirmed van der Weyden paintings. The figures in this earlier style are painted in a Flemallesque style, with an idealization of the heads, concern for narrative balance, emotion, decorative detail and gesturing. In his later years, van der Weyden seemed to have developed a disregard for accuracy in figure representation. According to Dr. Lorne Campbell, he "abandoned any pretence of obeying the laws of spatial recession," instead producing works in an almost proto-abstract manner, with figures pitched at different scales and sometimes bent in impossible ways. While these distortions are often not immediately obvious they can sometimes produce a general feeling of unease in the viewer, who often doesn't realize why the figures seem at once life-like and inherently two-dimensional. While van der Weyden's figures exude an unmistakable emotion and "clinical exactitude," the artist chose to play with their special proportions to achieve specific compositional effects. Works such as the Seven Sacraments and the Last Judgment exhibit this somewhat free-flowing style. Throughout his career van der Weyden remained dedicated to exhibiting real people with real emotions and so instead of glossing over our humanity, he embraced and highlighted it. Evidence suggests and scholars agree that Rogier van der Weyden was probably a pupil or close follower of the Master of Flémalle, now commonly identified as Robert Campin. Campin is believed to have moved to the Tournai region in the early 1400s, where he set up a prosperous workshop that received both civic and private commissions. Campin was one of the founders of the Early Netherlandish style of painting that espoused a naturalistic style that soon flourished in northern Europe as the Renaissance was taking hold in Italy and southern Europe. His style was one that relied on realistic observation to a larger degree than other painters before him. He was also one of the first painters to experiment with oil paints in lieu of the traditional egg tempera paints. This northern European art movement corresponded to and collaborated with (to a small extent) the Italian Renaissance taking place in southern Europe between the 1400s and 1500s. 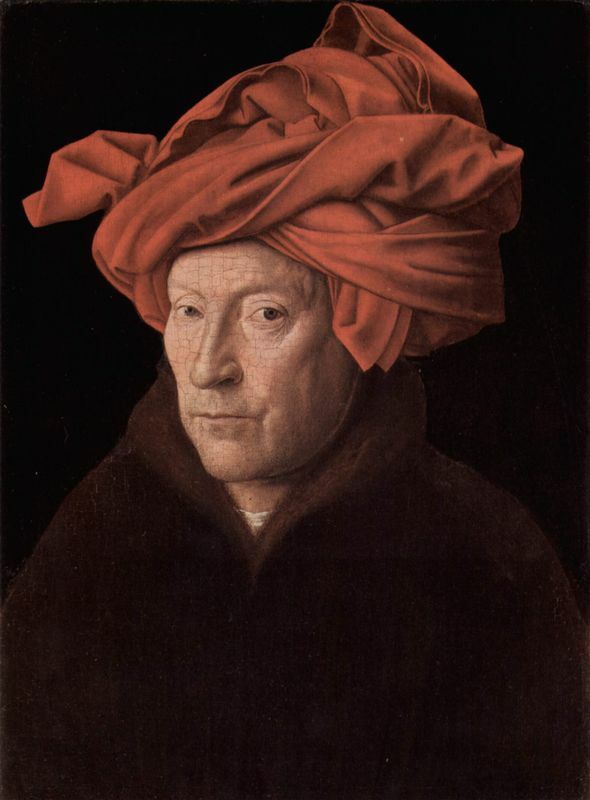 Scholars usually identify Jan van Eyck as the prototypical Early Netherlandish painter thanks to his reliance on techniques such as illusionism - the appearance that the viewer is a part of the painting - and complex religious iconography. 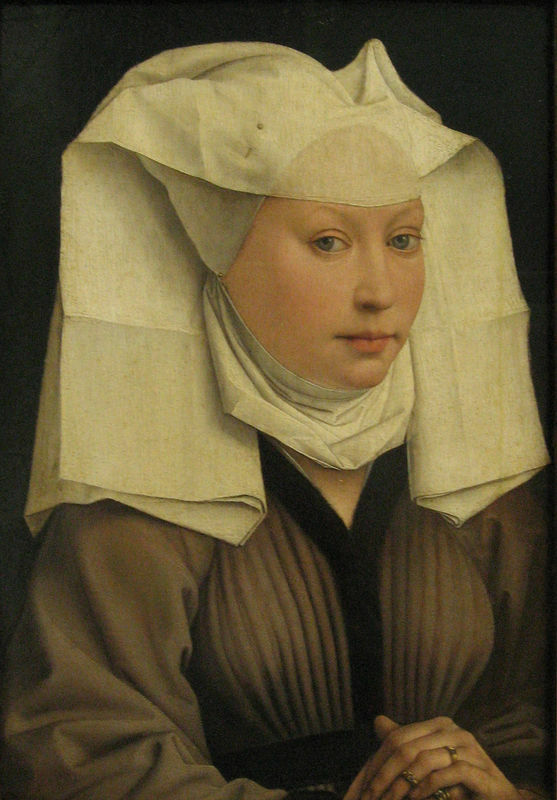 Early Netherlandish painters are considered the inventors and promulgators of modern oil painting, a technique that lent an added warmth and realism to their works. Scholars and art historians speculate that van der Weyden was a deeply devout Catholic (at least outwardly) who fathered a devout family. As well as actively participating in the Brussels Confraternity of the Holy Cross and making a number of charitable donations, van der Weyden's eldest son, Cornelius, was a Carthusian monk. All painters during this time would have relied heavily on commissions to paint religious images and scenes, with the most skilled and respected painting grand altarpieces. Van der Weyden is credited with painting a number of beautiful altarpieces, such as the Miraflores Altarpiece and the Descent from the Cross, where his personal religious conviction can be sensed. 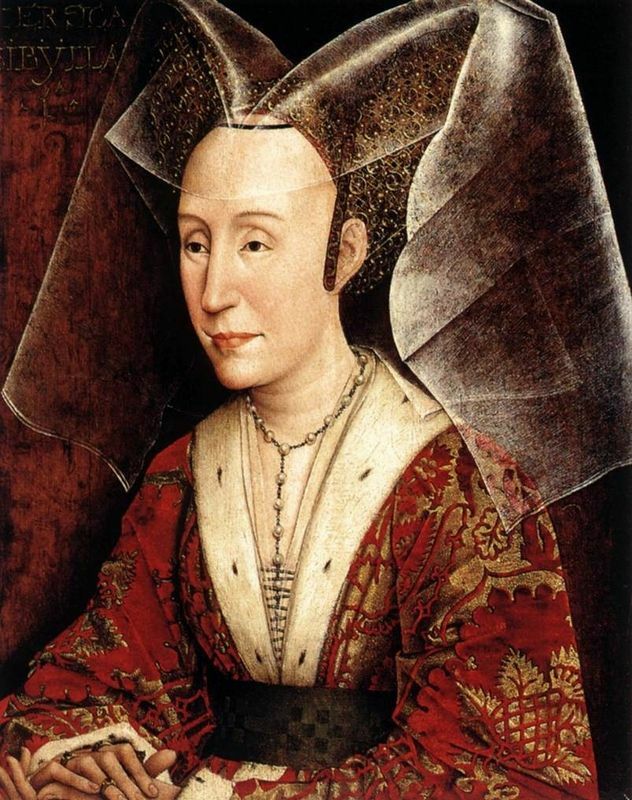 This German-born painter produced art in the Early Netherlandish style and is believed to have studied extensively under Rogier van der Weyden. Though it isn't possible to determine if Memling, also known as Memlinc, was actually a pupil in van der Weyden's studio, evidence and painting analysis suggests that Memling did study and practice painting under the supervision of van der Weyden for a considerable time. Memling spent most of his life in Bruges, where he received numerous commissions from religious institutions and wealthy private citizens. He is considered today to be on par with other "Flemish primitives," including van der Weyden, Jan van Eyck and Hugo van der Goes. 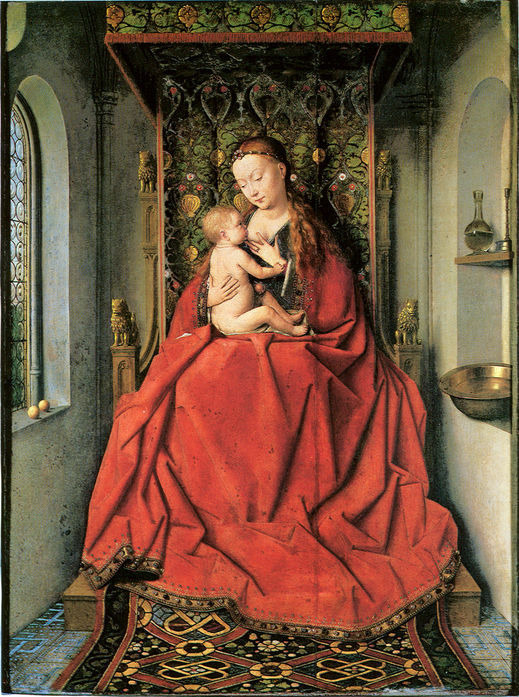 Rogier van der Weyden began achieving a sustained success early in his career. He was seen as an innovative painter, with a fresh vision and acute sense of emotion - qualities often devoid in artists during a time when formulaic religious depictions were widespread. During his career, artists in his workshop reprinted and imitated his works for dissemination throughout Europe. Van der Weyden's depiction of the Pieta, for instance, was striking, with strong diagonals and expression. It was replicated widely both within his workshop and by outside imitators and became the standard for Pietas through to the 16th century. What his contemporary imitators and students could not convincingly replicate, however, was the same subtlety and "contempt for mere representation" that van der Weyden so effortlessly achieved. Rogier van der Weyden was remembered during the 16th and 17th centuries as a well-respected artist and human being. People still marveled at his unique interpretations and subtly emotive subjects. But confusion began to arise during the 17th century regarding a painter named Roger of Bruges, who was receiving considerable praise from Italian scholars and writers. 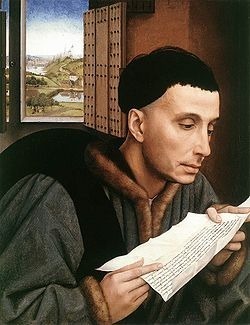 This mysterious Roger of Bruges was, of course, none other than Rogier van der Weyden, but the confusion that these were, in fact, two separate painters persisted for centuries, thanks to two biographies written by Karel van Mander.